Dr. Michelle Weddle grew up in Jersey City, NJ where she attended St. Dominic Academy. She was awarded a full tuition grant at Montclair State University, where she graduated from the Honors Program with a Bachelor of Science in Molecular Biology and a Minor in Chemistry. She attended New York University College of Dentistry, under scholastic scholarship, and graduated in 2002. She was then selected to train in the General Practice Residency Program at Newark Beth Israel, one of the largest and most comprehensive General Dental Residency programs in the nation. She is the recipient of the Eleonor Bushee Award for Academic Excellence and Leadership in Dentistry awarded by the American Association of Women Dentists; NYU University-Wide President’s Award for Leadership; Montclair State University’s Most Excellent Senior in Molecular Biology; and the William and Margaret Sokol Research Grant in Molecular Biology. Dr. Weddle continues a dental legacy that has spanned three generations, started by her grandfather and continued by both her parents. In 2007, Dr. Weddle was one of the youngest dentists to have been awarded Fellowship in the Academy of General Dentistry, receiving this prestigious designation before the age of 30. Dr. Weddle’s preferred approach to dental care is holistic in nature – looking at the overall health of the person and his or her immediate and long-term goals. 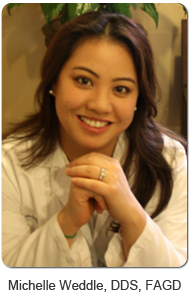 As a general dentist, she believes that her role is to be a resource for her patients in their general oral health. As such, Dr. Weddle has sought post-doctoral training in the following fields in order to provide her patients with a more diverse and personalized plan to fit their individual needs and wishes: implant dentistry; cosmetic dentistry; orthodontics and Invisalign; pediatric dentistry; dental sleep medicine; TMJ and dental occlusion (jaw mechanics). Integrating these advanced dental concepts and technologies with old-world caring and compassion are the hallmark of Dr. Weddle’s practice. She is known for her down-to-earth manner and for her passion in continually improving the technical delivery of her dental care. A leader in her profession, Dr. Weddle is also a member of the Bear Brook Study Club, the Warren Oral Surgery Study Club and the Vanguard Study Club; the current President-Elect of the Central Dental Society Component of the New Jersey Dental Association; a Fellow in the Academy of General Dentistry; a member of the American Dental Association; a member of the American Academy of Cosmetic Dentistry; and a peer-reviewer for manuscripts submitted for publication consideration in "General Dentistry", the Journal of the Academy of General Dentistry. She is an alumni of the world-renowed Pankey Institute and The Dawson Academy. Dr. Weddle loves spending time with her husband, Rich and their children Katie, age 8 and Matthew, age 5. She SCUBA dives and rides roller coasters whenever she can. She enjoys swimming and dancing (Latin, Country, Jazz, Modern, Belly and Bollywood), and is an avid reader. She finished her first triathlon in September 2011, and can't wait to do it again next year. We invite you to contact Great Smiles Elizabeth: Elvira Dela Torre, DDS at 908-352-7730 for all of your Invisalign Dentist and Dental Implants questions.